This is the 1st set of spiral reviews I use with my 8th grade students (I normally use this during the first few weeks of schools). 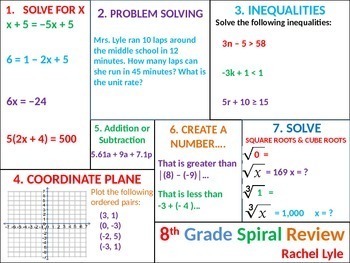 It spirals solving equations for x, problem solving/real world word problems, inequalities, adding and subtracting with variables, operations with scientific notation, square roots and cube roots, and plotting points on the coordinate plane. Some of these skills spiral back to 7th grade and some of the skills spiral forward to upcoming 8th grade skills (not covered in the 1st unit). This colorful spiral can easily be printed 2 to a page for students to work out as a hard copy. Could be used whole group or as a center. This set includes 6 slides. 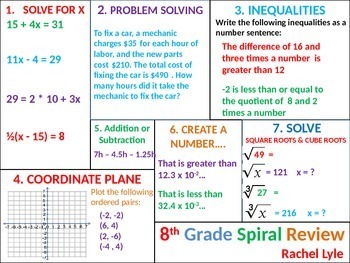 This could also be used at the end of 7th grade or in a gifted 7th grade math class. Please check out my other products for more spiral reviews for 7th & 8th graders!